Swarms settle in a “bivouac” before moving on to a permanent colony site. Central Coast Beekeepers co-ordinates the capture of swarms and wild hive removals in San Luis Obispo, using the expertise among our membership. If you have spotted a honeybee swarm, please our Swarm Dispatch coordinators. For North County swarms call: Mike Bruffey at (805) 235-0582, (805) 464-4141. Swarms are easily and safely captured by beekeepers. Swarms are the natural way bees expand their numbers. 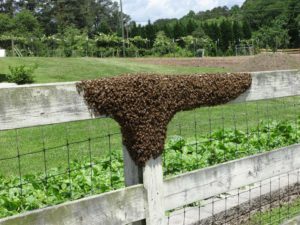 Bee swarms are not dangerous. Colony division is how honeybees grow. Bees in a swarm will settle temporarily in a “bivouac”, from this temporary spot they will send out scouts to locate a new home. When bees are in their “bivouac”, they are easily and safely collected. You can help our efforts by contacting us, and making note of the size and location of the swarm. Report Swarms online — Fill out and submit this form. 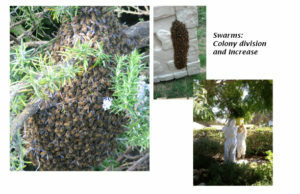 Swarm description (Size, height, how long have the bees clustered).